City's new land use and transportation plan has recommendations for people-first streets, but will they play out in real life? The last 60 years of Denver’s development has tethered entire generations of people to personal cars. The next 21 will be, supposedly, about cutting that cord. This post is the second in a series examining how the city’s “Denveright” plans might — or might not — make walking, biking, and transit legitimate options for everyone. These plans are still drafts. You can comment through October 31. Denver expects 189,000 more people and 136,000 more jobs by 2040. And it has a freshly baked guide to shape that growth without getting overrun with traffic. It’s called Blueprint Denver and it’s a sequel to the city’s 2002 land use and transportation plan of the same name. Blueprint is part of the “Denveright” suite of plans released Monday, but unlike the plans for transit and walking, the recommendations in Blueprint will be adopted by the Denver City Council. One of those, er, teeth is a recommended overhaul to the city’s street design regulations. Right now Denver Public Works relies on meek marching orders that make walking, biking, and transit an afterthought. Blueprint calls for cracking open that policy and changing it to align with stated city goals for sustainable transportation. The plan doesn’t prescribe exactly what those regulations will be, but it does provide a framework. That’s the official Blueprint recommendation. That should mean more and wider sidewalks, more and better crosswalks, and more traffic signals — even if it inconveniences motorists. Of course, Denverites have heard similar things before, whether in the Hancock administration’s Vision Zero plan to end traffic deaths or in the original Blueprint, which contained street design guidelines to put people first. Those guidelines were never really used the way city planners intended, according to David Gaspers, principal city planner with Denver Community Planning and Development. “We are set on making sure that doesn’t happen this time,” Gaspers said. The difference this time, Gaspers said, is that pedestrian-first streets would be baked into city policy. People biking and taking transit will be funneled to certain streets. City planners opted against recommending a “complete streets” policy, a simple directive that compels planners and engineers to favor pedestrians, bicyclists, transit riders, and cars — in that order — on every street. The hierarchy has proven transformational in places like Minneapolis. But it’s not in Denver’s cards, at least for now. 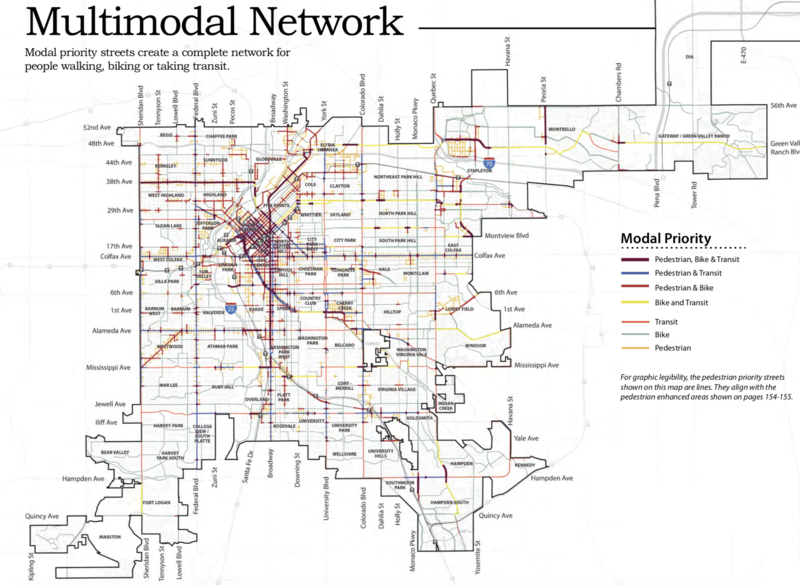 Instead, Blueprint creates a more complex “modal priority” network [PDF]. Maps identify where walking should dominate (all streets), where biking is the street’s main function, and where transit is the priority. Some streets will prioritize all three modes, like Broadway. “With a complete streets manual, we could lay out an ideal street type, but in an existing city with constrained right of ways and also a very robust network to rely upon, not all streets can… do all things at one time,” said David Gaspers, principal city planner with Denver Community Planning and Development. This approach is a double edged sword. On one hand, a transit-priority street that currently caters only to cars, like 17th Street, might see a bus lane supplant a general travel lane. But several important thoroughfares — including Colfax Avenue, Federal Boulevard, and Colorado Boulevard — won’t be complete streets under this arrangement. They’ll prioritize people walking and using transit, but protected bike lanes have no place there, according to Blueprint maps. Yet corridors like those are expected to absorb around 20 percent of all new households and around 25 percent of new jobs, meaning the most important thoroughfares of the future won’t be available for biking… still. The city’s future bike network will have parallel alternatives, according to Gaspers. This idea of street types isn’t new. Though more detailed, it was part of the first iteration of Blueprint. The difference is that, again, these guidelines would become part of internal regulations that DPW would have to follow. Denver has no shortage of plans calling for a great walking, biking, and transit network. Denver is also very far away from a great walking, biking, and transit network. It will take political will on the part of Mayor Michael Hancock, his appointees, and Denver City Council to pass, fund, and implement these policies and projects. The plan is still malleable and open for comment if you want to weigh in on what you’d like to see changed. The next article in this series will examine how development and land use policies recommended in “Denveright” could improve walking, biking, and transit.